Inexpensive whilst doing a good job. Packaging is normal ELF; basic but crisp. 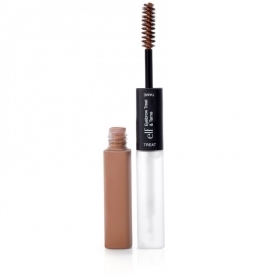 It's a great product for keeping the brows where they should be, it's kind of like a top coat to seal them on. For just £3.75 it's worth every penny. The treat (clear side) holds the brows in place. The eyebrow tame side (coloured) is a bit rubbish, it's awkward to apply and I have stopped using mine after a few goes. I love this just for the clear gel. I apply this every day on top of my manicured brows, it keeps the colour set and stops them from disappearing half way through the day.